Lately I've been obsessed with madeleines, petite cakes made with a genoise batter and are traditionally flavored with lemon or orange flower water. I never was able to find these cute little shell-shaped treats, and whenever I was in Seattle I would go to Starbucks and stock up. That is, until the Starbucks across Canada also started carrying them as well. How sad that I have to fulfill my indulgence of these little treasures at a Starbucks. I had read in one of my pregnancy books that I'll most likely be craving sweet things during the second trimester...and well, that is coming true. All I've been wanting lately are madeleines, ice cream (and I'm lactose intolerant!! ), and organic/natural gummy bears. 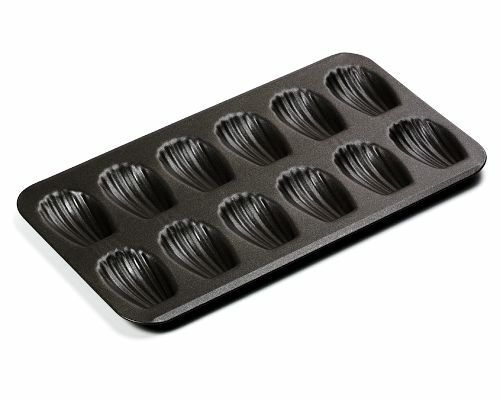 Unfortunately I was going to go broke trying to fill up on madeleines...that is, until I acquired my very own madeleine pan on a recent trip to Williams Sonoma! Isn't it just a thing of beauty?? I swear, if I had to choose one store to go nuts in with an unlimited amount of funds, I would pick Williams Sonoma! Now if I can only find cheap enough butter to make myself some madeleines...who knew butter was so expensive nowadays? ?